Upper gastrointestinal bleeding (UGIB) is a common medical emergency, with a reported mortality of 2-10%. Patients identified as being at very low risk of either needing an intervention or death can be managed as outpatients. For all other patients, intravenous fluids as needed for resuscitation and red cell transfusion at a hemoglobin threshold of 70-80 g/L are recommended. After resuscitation is initiated, proton pump inhibitors (PPIs) and the prokinetic agent erythromycin may be administered, with antibiotics and vasoactive drugs recommended in patients who have cirrhosis. Endoscopy should be undertaken within 24 hours, with earlier endoscopy considered after resuscitation in patients at high risk, such as those with hemodynamic instability. Endoscopic treatment is used for variceal bleeding (for example, ligation for esophageal varices and tissue glue for gastric varices) and for high risk non-variceal bleeding (for example, injection, thermal probes, or clips for lesions with active bleeding or non-bleeding visible vessel). Patients who require endoscopic therapy for ulcer bleeding should receive high dose proton pump inhibitors after endoscopy, whereas those who have variceal bleeding should continue taking antibiotics and vasoactive drugs. Recurrent ulcer bleeding is treated with repeat endoscopic therapy, with subsequent bleeding managed by interventional radiology or surgery. Recurrent variceal bleeding is generally treated with transjugular intrahepatic portosystemic shunt. In patients who require antithrombotic agents, outcomes appear to be better when these drugs are reintroduced early. Although the cause of a bleeding episode is uncertain until endoscopy is undertaken, guidelines often separate upper gastrointestinal bleeding into variceal and non-variceal bleeding because management and outcomes differ.3456789 This article covers the acute management of patients with overt upper gastrointestinal bleeding, summarizing evidence for risk assessment, resuscitation, blood transfusion, medical and endoscopic therapy, and early post-endoscopic management. We will not review interventions for long term secondary prevention of bleeding, such as testing for and treating Helicobacter pylori infection, use of non-steroidal anti-inflammatory drugs (NSAIDs), or maintenance antisecretory therapy. Upper gastrointestinal bleeding is managed by many clinicians across many specialties, including emergency room physicians, hospitalists, internists, gastroenterologists, surgeons, interventional radiologists, and hematologists. A variety of topics—including risk assessment, the threshold for blood transfusion, the timing of endoscopy, and medical and endoscopic therapies—have continued to evolve in recent years. In addition, it has become increasingly important and complex to determine the appropriate management of patients who need antithrombotic agents, with gastroenterological, cardiovascular, and hematological aspects needing to be considered. This article provides a comprehensive and evidence based summary of the assessment and management of patients with acute upper gastrointestinal bleeding, which is relevant to clinician specialists, academics, and clinical researchers. A summary of management is provided in box 1. Numerous randomized controlled trials (RCTs) and meta-analyses have assessed the use of medical and endoscopic therapy, and the optimal blood transfusion strategy in patients with acute upper gastrointestinal bleeding, thereby providing high quality data to guide management. Although the evidence regarding resuscitation, risk assessment, timing of endoscopy, and reintroduction of antithrombotic drugs is of lower quality, large recent studies in these areas have helped inform patient management. The incidence of upper gastrointestinal bleeding in the United Kingdom in the 1990s was 103-172/100 000 adults per year.1011 Recent reports from the United States using nationwide administrative databases indicate that the incidence of hospital admission for the condition was 61-78 per 100 000 persons in 2009-2012.121314 Peptic ulcers are the most common cause of hospital admission for upper gastrointestinal bleeding, accounting for just over half of all cases.1214 The incidence of hospital admission for the condition has decreased 21-23% during the past 10 years.1214 This decrease is largely accounted for by decreases in peptic ulcer bleeding (and bleeding ascribed to “gastritis”) probably because of the decreasing prevalence of H pylori and increasing use of antisecretory drugs. Case fatality rates from these database studies were low, in the range of 1.9-2.5%.121314 By contrast, large observational cohort studies from Europe suggest higher fatality rates of around 10%.1516 The reason for these differences is unknown but might be partly related to reliance on coding in database studies and differences in practice, such as low risk patients being more often managed in outpatient settings in Europe. We searched PubMed, Medline, and Cochrane databases from 2010 to August 2018 using the search terms gastrointestinal hemorrhage, peptic ulcer bleeding, and variceal bleeding. References were also identified from the international, UK, European, American, and Asia-Pacific guidelines on upper gastrointestinal bleeding published during this period in addition to relevant review articles. We selected systematic reviews, meta-analyses, RCTs, and observational studies (excluding case reports and small (<15 cases) case series). We also excluded articles that were not peer reviewed and those not published in English. Studies were prioritized by design, as noted above, and by patient numbers, quality, and publication date. As with any new patient with a medical emergency, the initial clinical evaluation of patients presenting with upper gastrointestinal bleeding involves assessment of the patient’s airway, breathing, and circulation. Many patients are hemodynamically stable at presentation, but for those with major bleeding, early resuscitation is essential. In general, two large bore intravenous cannulae are inserted, although central venous access may be preferred in certain cases. Regular monitoring of pulse, blood pressure, and oxygen saturations is crucial. Hypotension is associated with increased mortality; a multicenter observational study of 1882 patients reported an odds ratio of 9.8 (95% confidence interval 5.1 to 19) with systolic blood pressure <90 mm Hg versus ≥90 mm Hg.11 Tracheal intubation may be used to protect the airway in patients with severe ongoing hematemesis, especially in those at increased risk of aspiration (such as those with an altered mental status or lack of gag reflex). No RCTs have assessed fluid resuscitation in upper gastrointestinal bleeding. By contrast, a comparative study and an RCT in patients with hemorrhagic shock as a result of trauma suggest that a more restrictive fluid resuscitation may be better (or not worse) than more intensive fluid resuscitation.1718 The choice of intravenous fluid for initial resuscitation is unclear, with crystalloids or colloids often being used while the need for the transfusion of blood products is assessed. A meta-analysis of 70 trials with 22 392 patients found no difference in mortality between colloid and crystalloid solutions for fluid resuscitation in critically ill patients: relative risk 1.01 (0.93 to 1.10) for albumin or plasma proteins versus crystalloid solutions, and similar negative results when other colloids were compared with crystalloids.19 An RCT of 15 802 critically ill hospital inpatients found reduced acute kidney injury (odds ratio 0.91, 0.84 to 0.99) and a trend towards reduced mortality in hospital (10.3% v 11.1%; P=0.08) with balanced crystalloids versus saline.20 Whether these data can be fully extrapolated to upper gastrointestinal bleeding is uncertain. 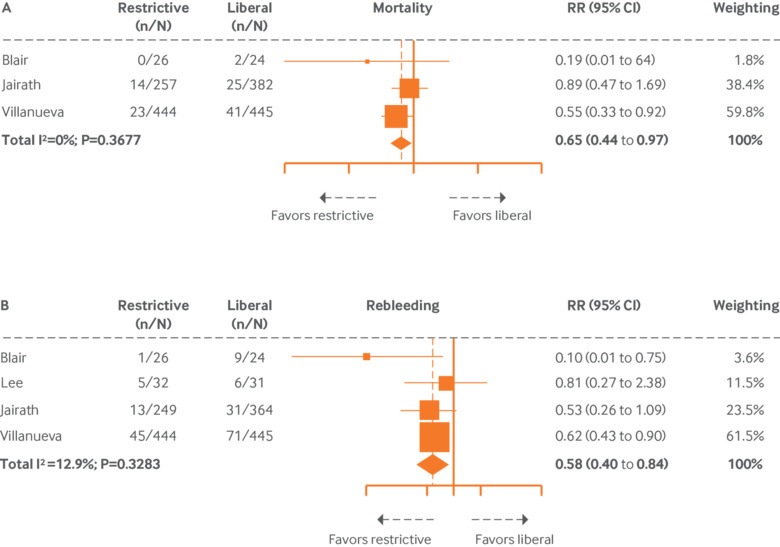 Blood transfusion meta-analysis: liberal versus restrictive transfusion for (A) mortality and (B) rebleeding.27 Reproduced with permission from Elsevier. Abbreviations: CI=confidence interval; RR=relative risk. 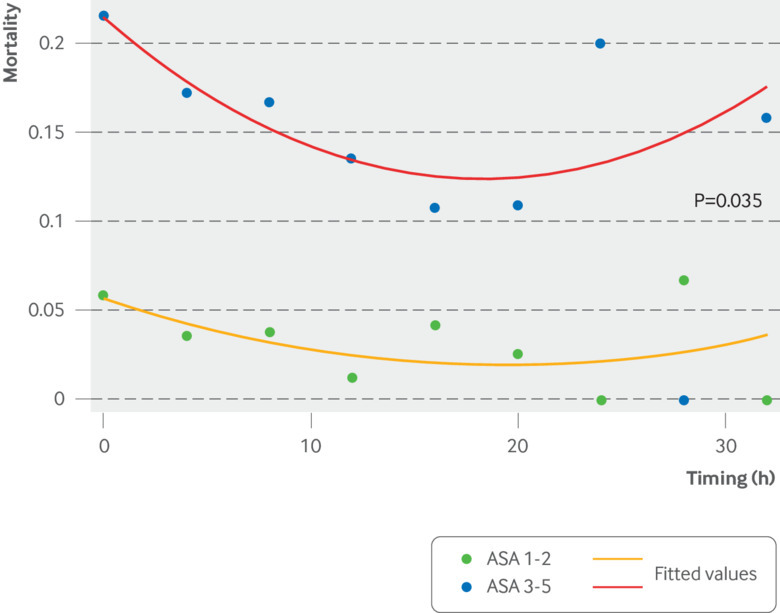 Many risk assessment scores have been developed for patients with upper gastrointestinal bleeding, including those that can be calculated early after presentation (pre-endoscopy) and those that include endoscopic findings.293031323334 They were designed to predict a variety of endpoints. We believe pre-endoscopy scores are of greater practical use because it is probably most important to predict risk soon after presentation to help direct management. The use of risk scores has been recommended to stratify patients into those at higher or lower risk of poor outcome.36 This enables patients predicted to be high risk to be managed in high dependency or intensive care units and receive urgent endoscopy, whereas those at very low risk can be managed as outpatients. 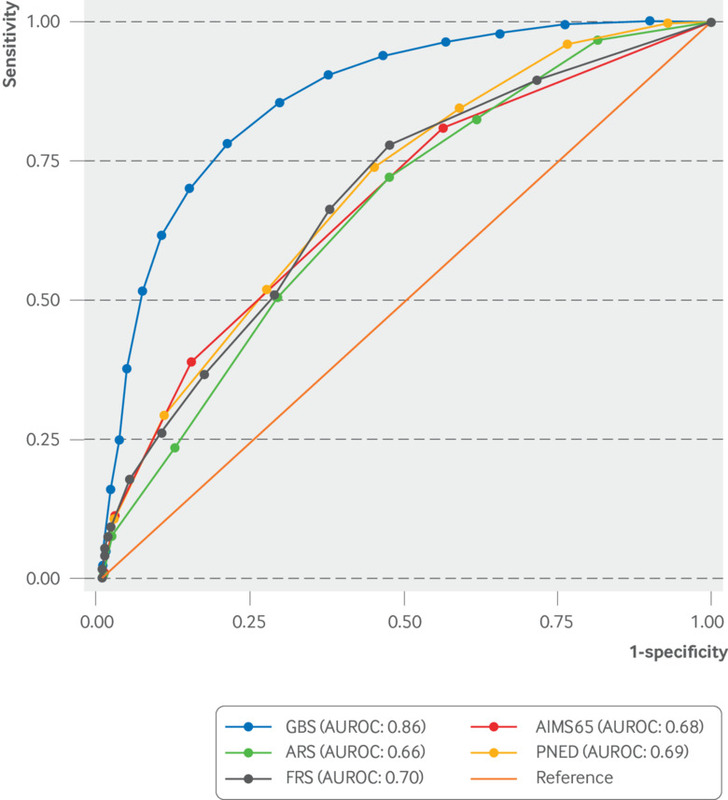 Comparison of five upper gastrointestinal bleeding risk scores in prediction of the need for any intervention (transfusion, endoscopic therapy, interventional radiology, or surgery) or 30 day mortality (n=1704).35 Abbreviations: AIMS65=see text; ARS=admission Rockall score; AUROC=area under the receiver operating characteristic curve; FRS=full Rockall score; GBS=Glasgow Blatchford score; PNED=Progetto Nazionale Emorragia digestive score. These risk assessment scores cannot precisely identify individual high risk patients who will definitely die if they do not receive the intervention. Therefore, they have limited clinical utility for predicting which patients are at higher risk. However, risk scores do seem to have a clinical role in identifying patients who are at very low risk.38 When aiming to identify a cohort of patients who are at very low risk and could be managed as outpatients, it is important to achieve a very high sensitivity so that almost no patients who may come to harm are sent home. Data on DOACs are limited, but because of their short half lives (5-17 h), anticoagulant activity wanes rapidly over one to two days (in the absence of renal disease). Thus, European guidelines state that “time is the most important antidote against DOACs.”5 Although PCC may be of some use in severe bleeding, particularly for Xa inhibitors, neither vitamin K nor fresh frozen plasma has been shown to be beneficial.551 Reversal agents for dabigatran (idarucizumab)52 and the factor Xa inhibitors (andexanet alfa)53 are now approved in the US. Their role in patients with upper gastrointestinal bleeding is unclear given the uncertain risk of thrombotic events and the short half lives of DOACS. They would mainly be used in patients with a severe ongoing bleed, especially if DOAC ingestion was recent or if renal disease was present. Because upper gastrointestinal bleeding can be diagnosed and treated with endoscopy, which is available in most hospitals, the role of other diagnostic modalities in patients presenting with an acute bleed is limited. In almost all cases, the initial diagnostic test will be upper endoscopy. Rarely, angiography or computed tomography is used in patients who are not candidates for endoscopy. However, these investigations are most commonly used if no source of bleeding is identified at endoscopy in patients with melena. A technetium-99m labelled red cell scan may also be used in this situation, but computed tomography angiography seems to be more accurate.7071 Early use of capsule endoscopy has been reported, with goals including stratifying risk and determining the timing of endoscopy,72 but more studies are needed to establish any potential role. On the basis of improved outcomes in observational studies,3528 guidelines recommend that, after appropriate resuscitation, most patients who are admitted with upper gastrointestinal bleeding should undergo endoscopy within 24 hours. Some guidelines suggest that patients with hemodynamic compromise and those with cirrhosis, who may have varices, undergo endoscopy within 12 hours after presentation,568928 because some observational studies and subgroup analysis of an RCT provided limited evidence of improved outcome in high risk patients when endoscopy is performed within six to 13 hours.737475 Features that have been considered high risk include GBS ≥8-12, bloody gastric lavage or persistent bloody emesis in hospital, hypotension, tachycardia, and comorbidities such as cirrhosis. However, evidence that can precisely identify high risk patients who should undergo early endoscopy is not available. In general, patients with persistent hemodynamic instability despite aggressive resuscitation will require urgent endoscopy. Association between timing of endoscopy and mortality in hospital patients with hemodynamic instability after correction for confounding variables.76 Abbreviation: ASA=American Society of Anesthesiologists score. Endoscopic injection of epinephrine should not be used as a single modality treatment. Meta-analyses have reported lower rates of further bleeding with an alternative modality compared with epinephrine alone (relative risk 0.58, 0.36 to 0.93) and with epinephrine combined with a second modality versus epinephrine alone (relative risk 0.34, 0.23 to 0.50).8283 Epinephrine can be used for temporary control of bleeding to aid visualization of the lesion before definitive treatment with another modality (such as a thermal or mechanical) or to decrease the risk of inducing bleeding with the application of a second modality. 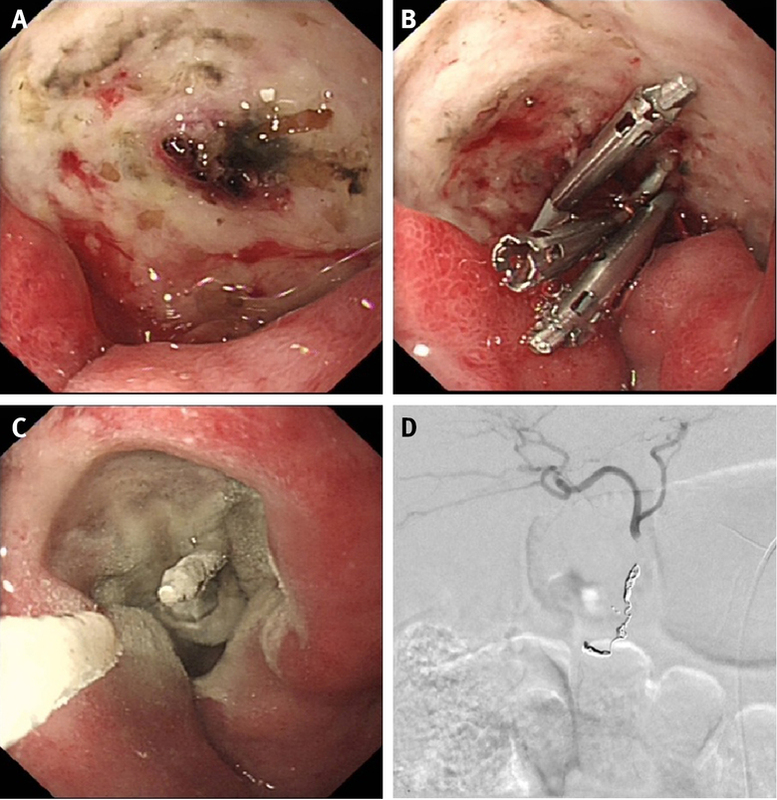 (A) Endoscopic view of a large posterior duodenal ulcer with intermittent bleeding from a visible vessel. The patient, a middle aged man taking anticoagulant drugs, was admitted with hematemesis, hemodynamic instability, and a hemoglobin concentration of 55 g/L. After resuscitation, transfusion to hemoglobin 70-80 g/L, and correction of coagulopathy, endoscopy was undertaken. (B) Through-the-scope clips were applied after dilute epinephrine was injected into the four quadrants of the ulcer base. The fibrotic base made application of the clips problematic. (C) There was ongoing intermittent oozing of blood. Given the high risk ulcer, hemostatic powder spray was then applied to good effect. High dose intravenous proton pump inhibitors (PPIs) were given and the patient was managed in the hospital high dependency unit. Because of the clinical situation and the difficulty in providing endoscopic therapy to this large fibrotic ulcer, the plan for urgent referral for radiological embolization—should early rebleeding occur—was clearly documented by the endoscopist as a “rebleeding plan.” (D) Fifteen hours later the patient rebled and became hemodynamically unstable. He was again resuscitated appropriately, after which an interventional radiologist performed coil embolization of the gastroduodenal artery. The patient had no further bleeding and was restarted on anticoagulants on day 3. When he was discharged from hospital a week later he was still taking oral PPIs twice daily, but when the 14 day course was finished, the dose was reduced to once daily. Transjugular intrahepatic portosystemic shunt (TIPS) may also be used after initial endoscopic therapy in the first three days after presentation for the treatment of acute esophageal variceal bleeding in patients with Child-Pugh class C cirrhosis (score 10-13)89 A multicenter RCT compared early (within 72 h) TIPS placement versus standard treatment with variceal ligation plus drug therapy in 63 patients with Child-Pugh C cirrhosis or Child-Pugh B cirrhosis with active bleeding. It reported that more patients were free from further bleeding at one year with early TIPS (97% v 50%; P<0.001).101 One year survival was also higher with early TIPS (86% v 61%; P<0.001) and encephalopathy was not increased. Subsequent reports suggest that the benefit is primarily in those with Child-Pugh C disease.102 However the evidence for early TIPS remains relatively limited and the practicalities may be challenging for many units. Several studies suggest a survival benefit from continuing or reintroducing antithrombotic drugs after upper gastrointestinal bleeding.103104 This is perhaps unsurprising given that mortality after presentation with a bleed is more often caused by underlying comorbidities, particularly cardiovascular disease, rather than the bleed itself.77 However, balancing the risks and benefits of reintroducing these drugs after a patient presents with upper gastrointestinal bleeding can be challenging. If an antithrombotic drug is reintroduced, a PPI is usually also administered. Similar to the situation with antiplatelet agents, observational studies in patients who develop upper gastrointestinal bleeding while taking warfarin indicate that those who restart warfarin have markedly lower rates of death and thromboembolic events, without a higher rate of recurrent bleeding, when compared with those whose warfarin is not restarted.104107 Recent guidelines suggest restarting warfarin from “as soon as hemostasis is established”6 to seven to 15 days after the bleeding event.5 The indication for anticoagulation should be assessed at the time of the bleed, with early reintroduction (zero to seven days) recommended in patients with a higher thromboembolic risk.56 However, robust data on the optimal timing of reintroduction are not available. Data on the timing of the reintroduction of DOACs after bleeding has been controlled are limited, and this clearly depends on the balance of risk between rebleeding and thromboembolic events. Use of the CHA2DS2-VASC (Congestive heart failure, Hypertension, Age-2, Diabetes, Stroke/TIA-2, Vascular disease) and HAS-BLED (Hypertension, Abnormal renal and liver function, Stroke, prior Bleeding, Labile INRs, Elderly (>65 years), Drugs and alcohol) scores may help in this situation.108109110 The recent Asia-Pacific guidelines suggest reintroducing DOACs in patients with a high thromboembolic risk as soon as hemostasis is achieved, although others have suggested that patients should have their anticoagulant restarted at day 7, with possible bridging therapy with low molecular weight heparin from days 2 to 7 in those with a low bleeding risk.6 In general, patients with an increased thromboembolic risk should have early reintroduction of antithrombotic drugs, because the risks and severity of thromboembolic events generally outweigh those of bleeding events. Treatment with OTSC is another relatively new technique. These clips are much larger than standard through-the-scope clips so may be successful when applied to larger fibrotic lesions or larger feeding vessels. A multicenter RCT of 66 patients with recurrent ulcer bleeding after initial hemostasis showed that significantly fewer patients treated with OTSC had further bleeding compared with those on standard therapy (15% v 58%; difference 42%, 22% to 63%).125 Further data are awaited, but at present OTSC may be considered as a rescue therapy when standard therapies do not achieve permanent hemostasis. As already noted, international, UK (NICE), American, European, and Asia-Pacific guidelines on upper gastrointestinal bleeding (non-variceal and variceal) have been published over the past eight years. We have therefore referenced them as appropriate throughout. The most recent ones—the European (2015) and Asia-Pacific (2018) guidelines on non-variceal bleeding, and the UK, international, and US guidelines on variceal bleeding—differ slightly from earlier ones, largely because they assessed more recently published studies (table 1). These guidelines have generally been written by experts in this field, although methodology has varied. Upper gastrointestinal bleeding remains a common cause of presentation to hospitals worldwide, and many recent studies have assessed the management of patients with this condition. The evidence of improved outcomes from a relatively restrictive approach to blood transfusion and the ability to identify patients who are at very low risk and suitable for outpatient management have recently altered clinical practice, and these alterations to management are now recommended by international guidelines. RCTs and meta-analyses confirm a benefit from pre-endoscopy antibiotics and vasoactive drugs in patients with cirrhosis, and post-endoscopy high dose PPIs for high risk peptic ulcer bleeding. Endoscopic therapy has advanced dramatically over the past decades, with recent additions to the endoscopist’s “toolkit,” including hemostatic powder spray, over-the-scope clips, and Doppler probes. These join the established and widely studied injection therapies, thermal probes, and clips used for non-variceal bleeding, and endoscopic band ligation and tissue adhesive injection for variceal bleeding. However, the newer modalities require further study to clarify their exact role in endoscopic management. Technical improvements and more widely available services for interventional radiology have led to it being the most commonly used rescue therapy for persistent or recurrent upper gastrointestinal bleeding that is refractory to endoscopic treatment. Surgery is now typically reserved for situations in which interventional radiology is unavailable, delayed, or unsuccessful. The more widespread use of antiplatelet and anticoagulants drugs has led to uncertainty in managing patients taking these medications who develop upper gastrointestinal bleeding. However, recent data suggest that relatively early reintroduction of these drugs once hemostasis has been achieved is the best approach in those with appropriate cardiovascular indications. New approaches under investigation for managing upper gastrointestinal bleeding include the early use of TXA and novel endoscopic techniques to reduce rebleeding. These and other developments will hopefully continue to improve management and outcomes for patients with upper gastrointestinal bleeding. What is the optimal approach to fluid resuscitation in patients with acute upper gastrointestinal bleeding? Can risk assessment tools be developed to allow accurate early identification of high risk patients with upper gastrointestinal bleeding, such as those who require endoscopic therapy or those with high mortality? What is the optimal timing of endoscopy after upper gastrointestinal bleeding? What is the exact role of hemostatic powder spray, over-the-scope clips, and Doppler ultrasound probes in the endoscopic management of upper gastrointestinal bleeding? When is the best time to reintroduce antithrombotic drugs after upper gastrointestinal bleeding? After email communication from the UK Gastroenterology Charity “Guts-UK” (previously CORE) to their members and related charities, three patients kindly volunteered to review the manuscript. In response to their comments, the sections on blood transfusion and timing of endoscopy were revised. Thanks to Deepak Vishwanath for help with the radiological image in fig 4. Contributors: Both authors contributed equally to the planning and writing of the article and both are responsible for the overall content as guarantors. Competing interests: We have read and understood BMJ policy on declaration of interests and declare the following interests: AJS, none; LL has had single consultancies to Takeda and to Bayer and his full competing interests are available from her on request. National Institute for Health and Care Excellence. Acute upper gastrointestinal bleeding in over 16s: management. CG141. 2012. https://www.nice.org.uk/guidance/cg141. Sanofi; Bristol-Myers Squibb. Plavix. Highlights of prescribing information. 2018. https://www.accessdata.fda.gov/drugsatfda_docs/label/2018/020839s069lbl.pdf.